Title removed for saftey reasons. After my last play with my VoIP(Voice over IP) setup I decided to fritter away some monies on a VoIP phone. After much deliberation I chose the GrandStream BudgeTone-102 and managed to source one from ebay for a bargin price of 50 quids. 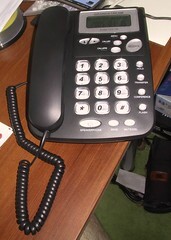 I now have this connected up to my asterisk PBX. I could have connected it straight to FWD(Free World Dialup) or even had it on-line directly but I decided that it would give me the most options to fiddle if I used my local setup! The phone itself it quite big and solidly built, although it is quite light. The sound quality is pretty good even on the speaker phone. It was simple to setup, getting it’s settings from my DHCP(Dynamic host configuration protocol) server and then putting the rest of the settings into the web based interface but pointing my browser at the phones IP address. So far I have managed to dial up my laptop, the FWD echo service and talking clock. All fun stuff, but as yet I have not setup and account for outgoing calls. It has some nice features such as getting the time from Internet servers and the Blue LCD(Liquid Crystal Display). It’s quite good to know that I can now have a VoIP phone on without having to have a PC on at the same time but I already thinking how nice it would be to have access to my address book and to have presence info from IM clients to let me know if other people are on-line or not. So for those of you who want to have a play with the future, get yourself a VoIP client and give us a ring. For those that don’t want to invest in a physical phone I here that pulver.Communicatior is pretty good and now has support for Skype as well. Another windows based one to try is X-Ten . Those on Linux, should try “Linphone”:http://www.linphone.org/?lang=us&rubrique=1 , “Kphone”:http://www.wirlab.net/kphone/ , “minisip”:http://www.minisip.org/ , “shtoom”:http://www.divmod.org/Home/Projects/Shtoom/ , or the latest CVS(Concurrent Versions System) version of “Gnomemeeting”:http://www.gnomemeeting.org/ have SIP support I think.